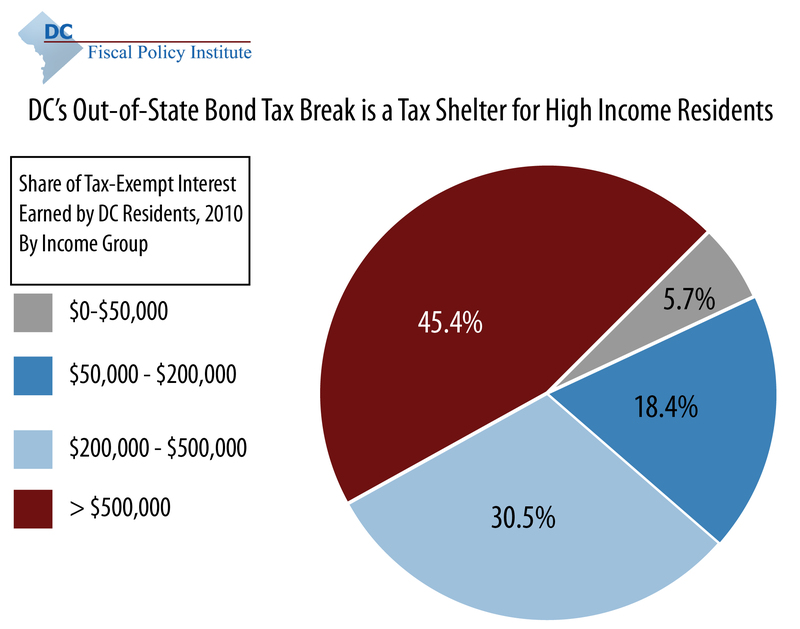 Who is affected by D.C.'s current policy of phasing out the tax break for out-of-state bonds? That question is central to an ongoing debate about the future of this tax break, which Mayor Gray has proposed to restore. Newly available data provide stark evidence that tax-exempt bonds serve primarily as a tax shelter for very high-income D.C. residents, many of whom earn millions each year from these tax-free investments. However, the data also show that a small number of residents, with much more modest incomes, rely on municipal bonds as a major source of income. This suggests that it makes sense for the District to continue phasing out the out-of-state bond tax break -- one that no other jurisdiction offers -- while taking steps to make sure that low- and moderate-income families are protected. Here is what the new figures, from D.C.'s Office of Tax and Revenue, show: Over three-fourths of tax-exempt interest income earned by D.C. residents goes to households who have income of $200,000 or more beyond what they earn from tax-exempt bonds. Indeed, 81 D.C. households earned an average of $2 million from tax-exempt interest in 2010, and these 81 households accounted for 43 percent of all tax-exempt interest earned in the city. At the same time, there are 338 households that have income below $50,000 and get more than one-third of their income from tax-exempt interest. These are likely to be the households that policymakers have in mind when they talk about restoring the out-of-state bonds tax break. Together, this suggests that D.C.'s current policy -- which maintains a tax exemption for all investments in out-of-state bonds made prior to 2013 and eliminates the tax break for new investments -- should be continued. It would raise roughly $1.7 million in revenue in 2014 and ultimately about $30 million per year. The current law maintains a tax break for investments in D.C.-issued bonds, which creates an incentive to buy these bonds, which, in turn, makes it easier and cheaper for the city to issue bonds. What about low- and moderate-income residents who rely on out-of-state bonds? The grandfathering of current tax exemptions provides time for these households to plan and adjust. Some will start investing in D.C. bonds, and others will seek other investment options, such as highly rated corporate bonds that yield similar after-tax returns. To further protect these residents, the District could allow households below a certain income level -- such as $75,000 or $100,000 -- to retain the tax break fully. A concern about protecting retirees who rely on out-of-state bonds makes sense. But using that argument to protect a tax shelter for multi-millionaires does not.